Two references about writing are in my mind as I walk around the Biennale exhibits. The first is something that novelist and writer Rachel Cusk said in a podcast I listened to while in transit to Venice, about the removal of dread in her writing process. In the recorded interview with Michael Silverblatt she talks about her attempts to eliminate dread from the prose in her novels: every time I forget to do it I feel the book begin to veer off the road. Going on to explain that as children we instinctively hate suspense (the fear of being lead into the unknown) but that as we get older we learn to accept it and to consume it. This, she describes as a kind ‘hardening’, often linked to religious ideas—towards ‘survival’. In novels, she reflects; plot has become the absolute vehicle and engine of dread. The second is a text re-introduced to me recently: Italo Calvino’s essay on ‘lightness’ from his Six Memos for the Next Millennium, in which the author addresses values of ‘lightness’ in literature as a way of analysing his own writing practice. He writes about weight in the way that Cusk speaks about dread, as a naturally-occurring (adhesive) substance: […] aware of the weight, the inertia, the opacity of the world —qualities that stick to writing from the start, unless one finds some way of evading them. For Calvino, much of his writing process involves the subtraction of weight. The curated exhibition at this year’s Biennale—Viva Arte Viva —has a positive outlook: dedicated to celebrating, and almost giving thanks for, the very existence of art and artists, whose worlds expand our perspective and the space of our existence. But, despite the curator Christine Marcel’s statement that Viva Arte Viva seeks to convey a positive and prospective energy, I am heavy-hearted leaving the exhibition spaces spread across the Arsenale and Giardini, which between them present the work of 120 invited artists from 51 countries. There are obvious difficulties to engaging with works in this overcrowded setting, and at times they seem to function best as a series of footnotes to the wider practices of individual artists: suggestions for further reading. Maybe this is why the national pavilions and collateral projects, more ‘self-contained’ and focused, have bigger impact. Within this glut of artwork, two complex, nimble exhibitions stand out. The introductory text for Geta Brătescu’s solo exhibition at the Romanian pavilion states that she has been a central figure of Romanian contemporary art since the 1960s, although regretfully I had never heard of her before. It becomes clear as I read on that there has been a boom of interest in her work in recent years with solo shows at Galeria Luisa Strina, São Paulo (2012) and Tate Liverpool (2015); and a major retrospective at the Hamburger Kunsthalle in 2016. The exhibition is titled Apparitions, after Brătescu’s remark that Memory is apparition ; an epiphany . The curation, by Magda Radu, focuses on two themes within her practice: a reflection on female subjectivity through various modes of conceptualising ‘the feminine’ and the studio. ‘Linia’ is a useful entry point to the show. We are given an insight into the artist at work but the images we see are upside-down. ‘Memoir’ [‘Memory’] (1990), sits at one end of the exhibition. A series of 40 abstract collages made in blue and navy swatches. 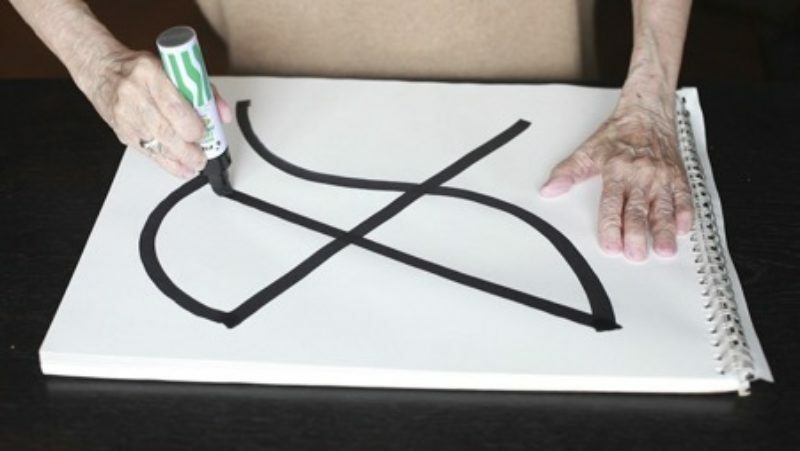 For Brătescu, there is no direct connection between the invocation of memory and representational forms. Memory is fluid and manifests at a point somewhere between recollection and the creative act: a repository of abstract forms, accessible in part through the hand. Playing at the opposite end of the room is another film ‘Atelieru’ [‘The Studio’] (1978), an intriguing document of the artist in her studio. In a three-part sequence, we see her sleeping on a chair next to various objects; waking up and marking out a creative space on paper; and carrying out various actions, games, and conversations with objects. The middle section shows Brătescu standing on a large sheet of paper, half on the wall, half on the floor. With a piece of chalk in hand she stretches from one corner to the other, marking the furthest point within her reach. These points become the corners of a large rectangle, and a stage for the creative activities that follow. Into the centre of this ‘box’ she takes some blocks on a string (an earlier work?) which she loosens and arranges like stepping stones. I would return to Venice just to see ‘Mâini’ [‘Hands’] (1974-76) again. This joyful series of pencil drawings shows the artist’s hands in various poses: detailing the interplay between shadow and object and showing off her extraordinary draughtsmanship. Sometimes the hand is interrupted by a cigarette, drinking glass or empty triangle. Other times, we can see through skin into bone and sinew. Alberto Giacometti considered himself an international artist and during his lifetime repeatedly refused to represent his native Switzerland at the Venice Biennale. Curated by Philipp Kaiser, the 2017 Swiss presentation at Venice focuses on Giacometti’s voluntary absence from the pavilion, in part through his relationship with American-born sculptor Flora Mayo. The exhibition, Women of Venice, presents the film ‘Flora’ (2017), by artist duo Teresa Hubbard & Alexander Birchler, alongside a recreation of a bust of Giacometti made by Mayo and a photograph of the two artists with the original sitting between them. The other half of the pavilion presents new sculptures by Carol Bove inspired by Giacometti’s upright sculptural figures. At the entrance, the wall text outlines the intentions of the exhibition: not to become another homage to the famous artist but instead ‘a rectification, a footnote and historical echo, a bass line that brings home the fact that there is no escaping the past—that history needs to be constantly, critically, rephrased and rewritten.’ It echoes the intentions of many cultural institutions with their sights set on reappraisals of lost or forgotten art histories, especially those of women, members of LGBTQ community, and people of colour. 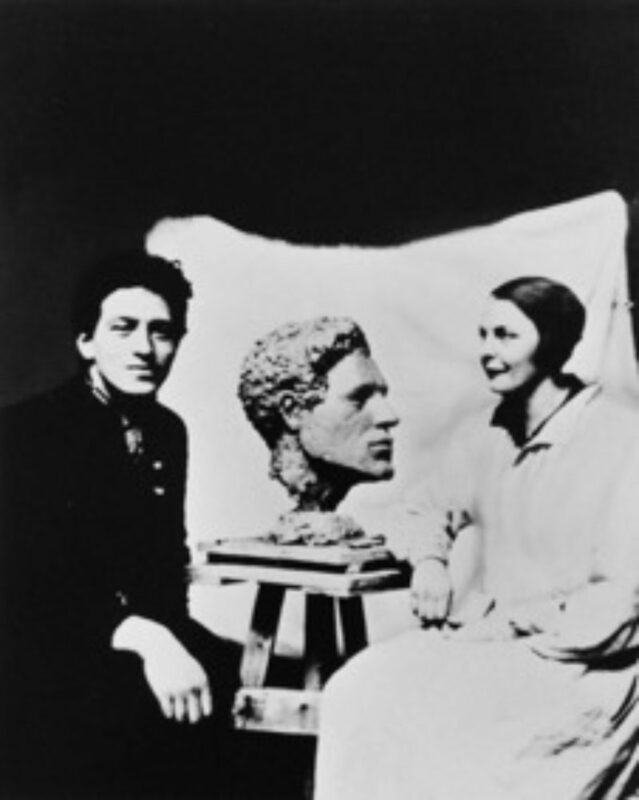 Cut to Mayo in her 1926 Paris studio (recreated from photographs in meticulous detail) working determinedly on a clay bust of Giacometti, who sits for her at the far end of the room. Mirroring the bust, Flora is framed from the shoulders up, while Giacometti is shot from the neck down. The colour side of the film, set in contemporary US, shows David Mayo, Flora’s only living child, speaking proudly about his mother’s life as a hardworking single parent. At 81, he has only recently discovered this side to Flora’s past from a Google search of her name which drew up a reference in James Lord’s Giacometti: A Biography . Hubbard & Birchler also came across Flora Mayo in Lord’s book while undertaking research for the exhibition. Probably shocked by the author’s dismissive treatment of Mayo and intrigued by the photograph which now forms the basis of their exhibition, the artist duo set their sights on finding out more about the young American sculptor. Lord apparently used this photograph to interpret Mayo’s character and her role in Giacometti’s life. One extract, in which we hear David Mayo read aloud, is particularly callous and sexist. She was attractive but not beautiful, and there is something weak in her face. It must have been apparent even then that she was one of those destined to be destroyed by circumstances. The full force of Flora’s ‘absence’ from art histories is sensed when David is shot walking through Zürich on his way to see work by Giacometti for the first time at the Kunsthaus Zürich. In particular he is there to see the painted bust of his mother which was made by Giacometti in 1926 (she gave it back to him when she moved back to the US in 1933). Passing several posters for the show en route, perhaps he is wondering what would have happened if Flora had had the same opportunities as Giacometti, whose name is plastered across buildings throughout the city. The less straightforward thing about Hubbard & Birchler’s work, in light of recent institutional reassessments, is that not a single piece of artwork by Flora Mayo exists now. All of it was either destroyed or left behind in Paris. Meaning there will be no critical reappraisal of her work, such as with that of Leonora Carrington, Claude Cahun and Hilma af Klint in recent years. The only remaining evidence of Mayo’s practice is the plaster bust captured in the photograph now framed and hanging in the Swiss pavilion. But precisely because of this material void, and the lack of ability to make judgements on style and quality, the problematic wider structures that allow omissions like this to happen are forced into view. In an odd twist, it was Lord’s shocking dismissiveness that drew the figure of Flora into focus for Hubbard & Birchler and prompted this review of her legacy. This captivating installation by Hubbard & Birchler, which supports an impossible dialogue between an elderly son and his young mother, is an impressive example of how ‘rephrasing’ and ‘rewriting’ histories can carry an emotional impact. Photographer unknown. Original photograph belonging to Flora Mayo, kept under her mattress, lost. Film negative missing. Reproduction from only known duplicate print, archive of Fotostiftung Schweiz, Winterthur. Original clay bust portrait of Alberto Giacometti by Flora Mayo, lost. Reconstructed and cast in brass. We learn from David Mayo that Flora had a daughter at 19, from her first marriage which was arranged by her family, but gave custody over to the father before moving to Paris where she enrolled in art school and met Giacometti. David never met his sister but discovered she had passed away a few years ago.